here's how to take the Y-axis leadscrew apart from the retaining block. 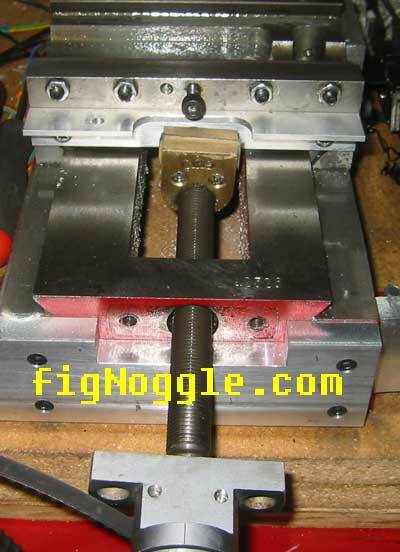 here's how to remove the X-axis leadscrew. rotate the y-axis handle counter clockwise as far as you can go. remove the two socket head screws holding the retaining block to the base. take the handle and key off the screw. this is what you get. 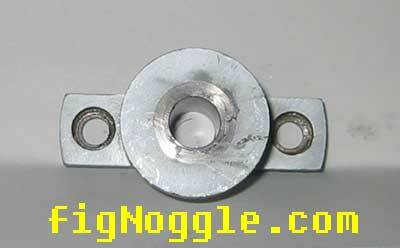 if you've taken the x-axis screw apart you'll notice that it has thrust bearings. not the case in the y-axis. so, take two blocks of wood taller than the length of the screw and set them under the retaining block. start tapping the front of the screw (where the handle end is) with a hammer. please use a block of wood, brass or something that won't damage the threads. here you see a picture of the assembly half-way through. keep tapping away. now the screw is removed from the retaining block. here is a close up of the retaining block. imagine that - no bearings! i've ordered a 5/8" x 8TPI acme screw and delrin round bar. hoping to smooth the action of the screw and reduce backlash. even a new bearing block will be made. check back here as this procedure will be documented and the results posted!